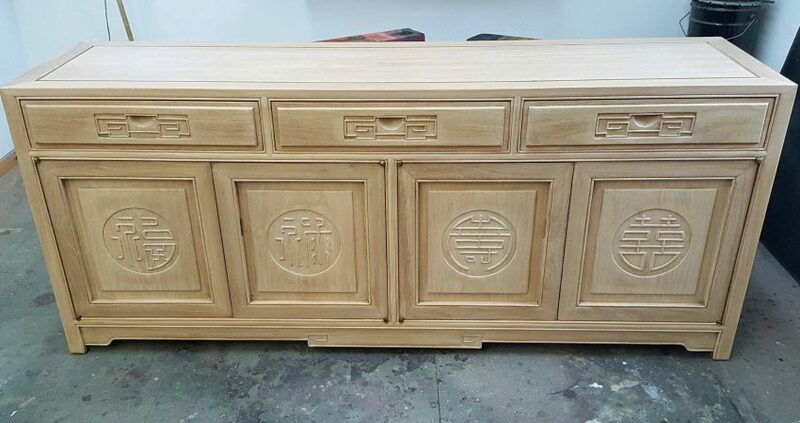 The natural reddish-brown color of this oriental sideboard was lightened by stripping off the old finish and bleaching it 3 times. A custom off-white stain was mixed and applied to fill the pores. It was then sealed it with 2 coats of a water-based matte finish to maintain a natural raw wood look. Other tasks for this project involved shimming a crack in the top, removing some dark water stains on the top, and installing magnetic push-to-open door catches. This sideboard was refinished for a Lakeville CT client.